Massed ranks of supporters in the Messeplatz to watch the show courts but on the morning of Thursday 1st June at the Liebherr 2017 World Championships in Düsseldorf, it was disappointment for the home crowd. Just one German player competing in three doubles events booked a quarter-final place; it was that of Petrissa Solja. The major disappointment was the defeat of Timo Boll in harness with China’s Ma Long. Timo Boll and Ma Long suffered defeat at the hands of China’s Fan Zhendong and Xu Xin, the no.3 seeds (11-13, 12-10, 11-8, 11-9, 11-8), the reverse coming after Petrissa Solja had partnered Fang Bo, also from China, to Mixed Doubles success against Chinese Taipei’s Chuang Chih-Yuan and Chen Yen-Su (11-4, 11-9, 11-6, 11-7). Wins as seeding predicted; Timo Boll and Ma Long started proceedings as the no.17 seeds; Fang Bo and Petrissa Solja as the no.7 seeds with Chuang Chih-Yuan and Chen Yen-Su being the no.11 seeds. Disappointment for Germany and there was more, Patrick Franziska in partnership with Denmark’s Jonathan Groth, the no.2 seeds and European champions, experienced defeat at the hands of Pavel Platonov and Vladimir Samsonov of Belarus (11-8, 8-11, 11-7, 11-5, 4-11, 9-11, 11-7). Defeat for the no.2 seeds, but for the remaining leading partnerships it was success. In addition to Fan Zhendong and Xu Xin, Japan’s Masataka Morizono and Yuya Oshima, the top seeds, beat Belgium’s Martin Allegro and Fabien Lambiet (11-2, 6-11, 11-5, 11-5, 12-10); Korea’s Jeoung Youngsik and Lee Sangsu, the no.4 seeds, defeated Singapore’s Gao Ning and Pang Xuejie (12-10, 8-11, 10-12, 9-11, 11-3, 11-9, 11-6). 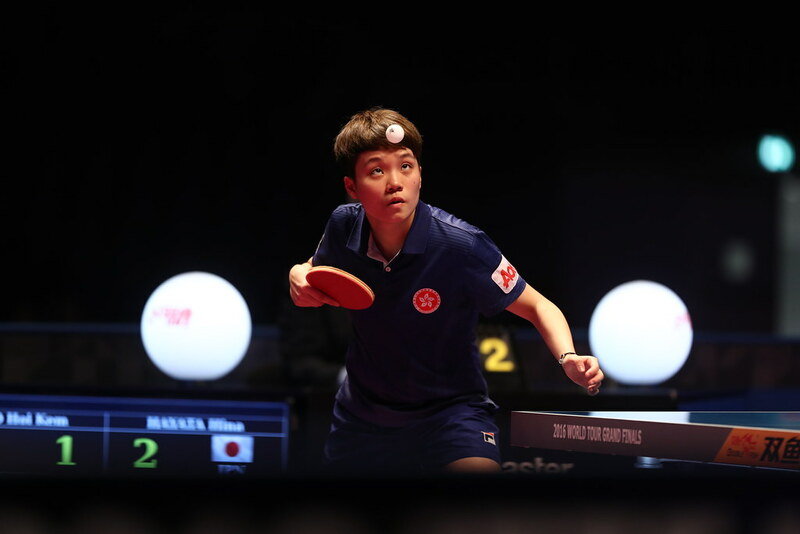 Success for Lee Sangsu in round three of the Men’s Doubles event, it was the same in the Mixed Doubles competition. Partnering Yang Haeun, the top seeds, they accounted for Hungary’s Krisztian Nagy and Szandra Pergel (11-2, 11-8, 11-4, 11-5). Likewise, there was a third round success for Hong Kong’s Wong Chun Ting and Doo Hoi Kem, the no.2 seeds, they beat the combination of China’s Jonathan Groth and China’s Feng Yalan (11-8, 11-8, 5-11, 7-11, 9-11, 11-9, 11-8). In a similar vein; not to be outdone, Sweden’s Mattias Karlsson and Matilda Ekholm, the no.3 seeds, ended the progress of Russia’s Grigori Vlasov and Yana Noskova (5-11, 11-7, 11-8, 12-10, 10-12, 11-5). However, in the third round of the Mixed Doubles event the partnership to impress was that of Spain’s Alvaro Robles and Galia Dvorak. The second round winners against Hong Kong’s Ho Kwan Kit and Lee Ho Ching, the no.4 seeds (6-11, 7-11, 11-8, 11-9, 5-11, 11-9, 12-10), they continued their good form to beat Egypt’s Omar Assar and Dina Meshref (13-11, 11-7, 8-11, 11-9, 12-10). Does that not make Alvaro Robles and Galia Dvorak the first ever Spanish pairing to reach a doubles quarter-final of any description at a World Championships? Three of the top four seeds through to the quarter-finals in each of the Men’s Doubles and Mixed Doubles events; it is the same in the Women’s Doubles where Germany again suffered. Petrissa Solja and Sabine Winter lost to Hong Kong’s Doo Hoi Kem and Lee Ho Ching, the no.2 seeds (11-5, 11-6, 11-7, 11-4). Success for Hong Kong and there was also success for China; Chen Meng and Zhu Yuling, the no.3 seeds, beat Hungary’s Dora Madarasz and Szandra Pergel (11-5, 11-6, 11-7, 11-4); Ding Ning and Liu Shiwen, the no.4 seeds, ended the hopes of Japan’s Miu Hirano and Kasumi Ishikawa (12-10, 9-11, 11-3, 11-4). Meanwhile, in the section of the draw vacated by top seeds, the combination of Sweden’s Matilda Ekholm and Hungary’s Georgina Pota in the opening round when losing to the partnership of Ukraine’s Tetyana Bilenko and Viktoria Pavlovich of Belarus (4-11, 11-7, 11-9, 8-11, 11-8, 13-11), the pair to reach the last eight is that of Singapore’s Feng Tianwei and Yu Mengyu. In the third round they beat the formation of Slovenia’s Alex Galic and Rachel Moret (11-7, 12-10, 7-11, 11-7, 11-5), the second round winners of Tetyana Bilenko and Viktoria Pavlovich (12-10, 8-11, 8-11. 11-4, 6-11, 11-7). The effect is that Lee Sangsu and Wong Chun Ting remain unbeaten in an all three events.